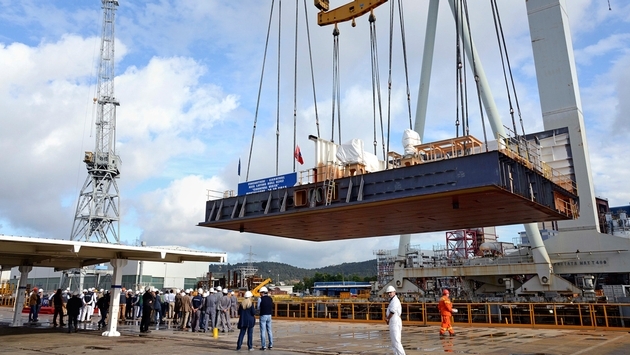 Carnival Cruise Lines’ newest and largest-ever ship is taking shape as the first 500-ton block was laid at Fincantieri’s shipyard in Monfalcone, Italy. The construction milestone was marked with a traditional keel-laying ceremony on Oct. 14. The 133,500-gross-ton Carnival Vista is scheduled to enter service in spring 2016. It will accommodate up to 4,988 passengers. So far, Carnival has revealed few details about the ship, but expect that to come in time. Rumors floating around in cyberspace speculate that the ship would have the first IMAX theater at sea, but nothing has been verified. Carnival has said the ship will feature Fun Ship 2.0 dining, bar and entertainment offerings along with “several innovations unique to this vessel.” The Fun Ship line promises more details, as well as homeport and itinerary information, early next year. At its current estimated gross registered tonnage of 133,500, Vista would be just slightly larger than the sister ships Carnival Breeze, Dream and Magic, which are 130,000. Gross registered tonnage is a measure of volume and space in cruise ships, not weight.